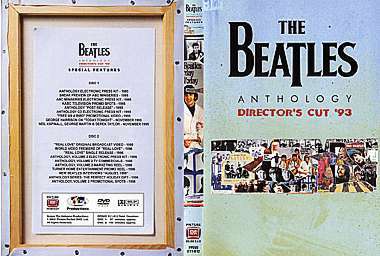 Here is how the producers of this set explained the differences between the 1993 Directors Cut and the 1995 Beatles approved version. The beautifully packaged deluxe 10-DVD box set includes detailed liner quotes, full color brochures, high-quality video transfer, special features and a custom storage box complete with new Anthology artwork. This is an extremely limited edition pressing. Story VS Performance - The 1993 Directors Cut of Anthology focused primarily on the Beatles story, using performance footage only to enhance the story. The final version would remove much of the story and details to include as much TV and concert footage as possible. At the time this appeared to be the best approach, but in retrospect opinions may change after hearing the uncut interviews; this was after all their one chance to tell their story. Collectors have countless sources for the TV and concert footage, but only one option to hear their story as done for the Anthology series, until now that is! and concert footage as possible. 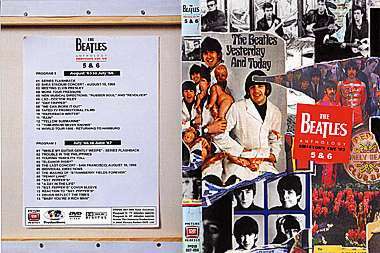 Uncensored Version - Comparisons between the two versions of Anthology clearly show heavy editing. An entire sequence regarding Yoko Ono and her effects on the band has been cut-down to almost nothing; only on the 1993 version will you hear unedited and sometimes unflattering comments. Many interviews did not even make it to the Anthology book. One example is George commenting on the positive experiences he had with drugs, including the famous dentists real name! 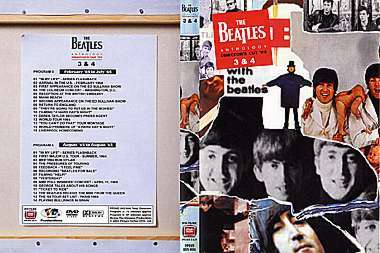 The 1993 directors cut also includes the original extended sequence on Georges songwriting later trimmed at Georges request. It becomes obvious by program 1 what you are seeing is what the director and production team assembled and presented to the band before the Beatles made numerous change request. Program Beginnings - Each program begins with an unused animated sequence in place of the Help! Introduction. In My Life Opening Montage - Programs 1-4 use this song montage with the commercial version using it only to start program 1. The early montage contains different shots from the final version including Allen Klein. While My Guitar Gently Weeps Montage - Ideas about this montage were changing by program 5, and no song montage was used for this program. For program 6, a different approach/song was used, and for the first time it was flash forward montage, using much footage not seen elsewhere in the program. Programs 7-8 dropped the montage idea entirely. Quality Of Archival Footage - At this early stage, Apple had to use what footage it had available with quality varying from poor to ex. Some of early TV appearances and newsreels are obviously taken from VHS screening tapes, and many include time-codes. Some scenes contain the text "Temporary Picture". All of the new interviews and Apple owned material, including footage taken directly from the original cut of "The Long And Winding Road" look great and contains no time code. It is quite interesting to see what Apples film archives looked like in 1993. In 1995, Anthology producer Chips Chipperfield hinted at what this early version might look like when asked why they could not just use the original 10-hour version for the home video release "We can but thats off-line. Off-line is a rough cut. Its cut from whatever archive sources we have so a lot of it is VHS." Unused Neil Aspinall Interviews - For most of the first two programs, we see Neils first interview sessions with him not wearing a hat, the stories heard vary from the commercial version. Derek Taylor - Derek has a larger role in the early version of Anthology, and is featured in numerous unseen interviews. Program Endings - An early idea was to end each program with a sequence showing the progression the band was making. Examples would be an overhead view showing the move from Liverpool to London, or the move from London to the US. 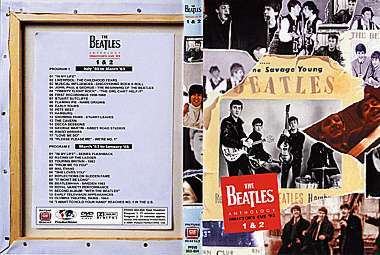 Audio Outtakes - It is important to note that the 1993 Anthology uses very little studio outtake recordings. There are no created studio sequences of audio outtakes. We dont hear any real audio outtakes until the 1968 studio sessions, as the audio outtakes were still being examined at this early stage of production and were not made available to the production team just yet. But we do get to hear the unused "Hums" ending for "A Day In The Life" along with part of Take 4! No Closing Credits - At this early stage, none of the eight programs contain closing credits. 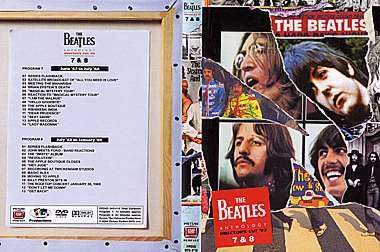 1993 Ending - At this early stage, the documentary ends with the "Let It Be" sessions and rooftop concert. Program 8 part 1 dates from December 1993. 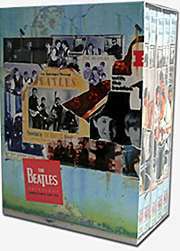 1994 would alter the documentary considerably, with the three remaining Beatles reforming to record new music and joint interviews. It was at this point; the 1993 version was heavily re-edited leaving only a hint of what it had originally looked like. Tribute to Mal Evans includes short "Maxwells Silver Hammer"
Different edit of color 8mm films set to "It Wont Be Long"
Longer segment on meeting cripples on tour, George "John was allergic to cripples"
More comments on the 1964 tour and police, Ringo "The police were very good to us, they used to steal pills from the kids and give em to us"
Segment on Derek, Paul "It was very hectic being the Beatles publicist, Derek became a raving alcoholic"
Different re-creation of fans room. Different camera panning and differences between color and b&w. More details on 1964 Holland/Aussie Tour. George, "How many Beatles does it take to change a light bulb?" More details on the Hollywood Bowl recordings; George "It must have been crap"
Different comments on smoking reefer before meeting the Queen. An unused section about playing in Spain, and the details surrounding the performances. Unseen concert footage from Madrid. Different interviews/segments on Help! film. George "We smoked reefer on the plane to the Bahamas, we used Mals cigar smoke to cover it"
Segment on Georges songwriting with Paul explaining why they did not include George in the song-writing partnership. George "They wrote all their crap songs early"
Different sound mix on Shea footage, inserts vary from commercial version. Longer montage of 1965-tour footage set to "Run For Your Life"
Longer Bedroom/BBC Radio sequence before "We Can Work It Out"
Alternate "Eleanor Rigby" sequence. Pauls performance is in color and runs longer. Neil explains how the second Japan show was better than first. Ringo "It was?" Unused interviews from Paul about George and "Taxman"
Neil, "they never practiced their Revolver songs for tour"
More details on the origins of "Yellow Submarine"
Different montage for "Sgt Peppers" using b&w film footage not photos to represent people on the cover. Long segment on how the cover was designed and who was selected and why. Longer segments and comments regarding Brians death. More details/comments on "Magical Mystery Tour". Neil on the origins of "Strawberry Fields Forever"
Long unused segments on Yokos effect on the band, George "Yoko saw us as a wedge between her and John." Paul "We were like her courtiers"
Comments from Paul, George and Ringo on the music of "Two Virgins"
Longer segment from Paul on writing "Hey Jude"
"Get Back." Unused montage from Apple studios is used to illustrate the problems they were having with George Martin.